Hobart is the capital of Tasmania and Australia’s second oldest city after Sydney. The city is located on the Derwent River at the foot of the 4,000-foot tall Mt. Wellington. Hobart has many elegant old buildings made of Sandstone and built by convicts in the 19th century. 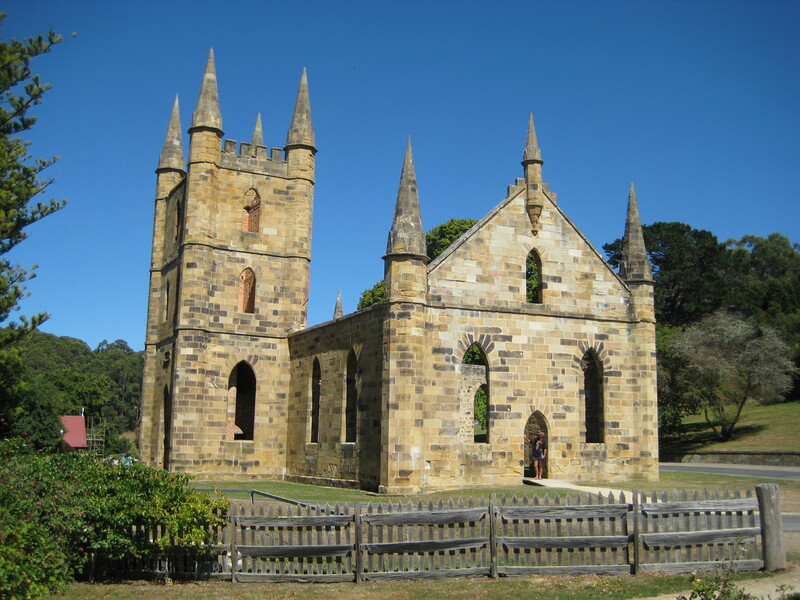 Our tour on this day took us to the Port Arthur Historic Site, which is a World Heritage Site. Port Arthur was very unique in that it was not only a prison but also home to military personnel and their families and home to free settlers. The convicts worked at farming and industries, producing a large range of resources and materials. The historic site contains about 30 historic buildings, extensive ruins and beautiful gardens and grounds. A short ferry ride from the site is the Isle of the Dead cemetery where more than 1,100 people were buried. The cemetery was used for not only prisoners but for officers and their families as well. There was also a boys prison at a nearby location, where boys as young as nine but mostly between the ages of 14 and 17 were held. The boys were sternly disciplined and harshly punished as well as educated. 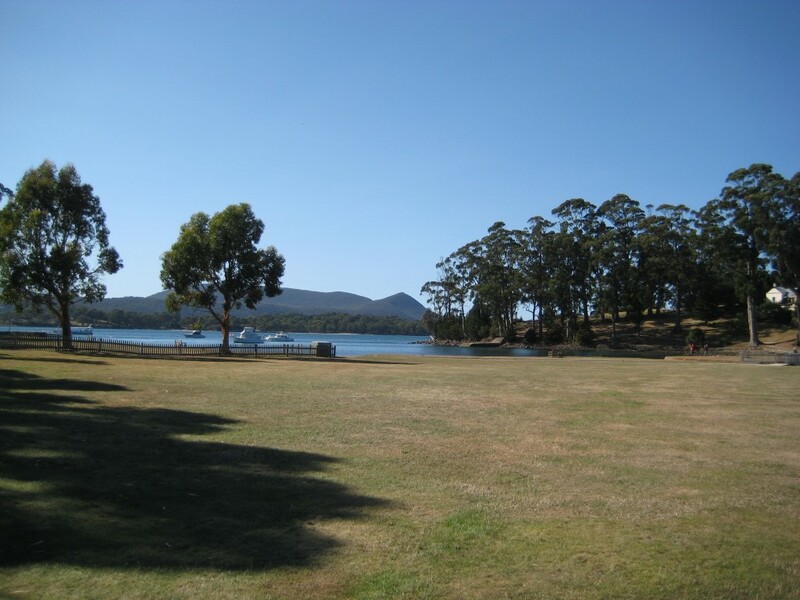 The Port Arthur penal station was established in 1830 as a timber-getting camp, using convict labor to produce sawn logs for government projects. From 1833 Port Arthur was used as a punishment station for repeat offenders from all the Australian colonies. The Port Arthur prison was fashioned after a new English penitentiary designed as “a machine for grinding rogues into honest men”. The idea was that through discipline, punishment, religion, moral instruction, classification and separation, training and education, that you could be rehabilitated. Many of the men left Port Arthur broken, but others left rehabilitated and skilled, some as blacksmiths, shoemakers and shipbuilders. By 1840 more than 2,000 convicts, soldiers and civil staff lived at Port Arthur, which by this time was a major industrial settlement. A range of goods and materials were produced here, everything from worked stone and bricks to furniture and clothing, boats and ships. With the end of convict transportation in 1853, Port Arthur became an institution for aging and physically and mentally ill convicts. In 1877 the penal settlement finally closed and many of its buildings were dismantled or destroyed in bush fires. Others were sold and the area gradually became the center of a small town, renamed Carnarvon in an attempt to erase the hated convict past. First hand stories of convict life proved to be a major draw and tourists began visiting almost immediately after the closure of the penal settlement. By the 1920’s, some convict-period buildings had become museums, hotels, shops and the settlement was once again named Port Arthur. On Sunday April 28, 1996, a tragic chapter was added to Port Arthur’s history when a gunman took the lives of 35 people and physically wounded 19 others in and around the Port Arthur site. This led to the country banning automatic weapons and rifles and more than 800,000 weapons were purchased back by the government. With this came a dramatic drop in gun violence and suicide in the country, which is still enjoyed to this day. The site is situated on a quiet bay with the hills rising around it. Many of the beautiful sandstone structures stand in ruins, but are at the same time elegant and beautiful. The solitary confinement prison has been restored, as has the asylum, which houses a museum. Several of the officer’s homes have been restored and furnished, and can be visited. Our time here was too short to see everything but at least we got an idea of the area. Lunch was at a Port Arthur pub called Fox and Hounds. There we had a salad, breaded and deep-fried chicken breast with brown gravy, roasted white potato, mixed vegetables and a date cake with some type of very sweet syrup sauce. On our fifty-mile return trip to Hobart we stopped at the small historic convict village of Richmond with its charming strip of sandstone buildings. It is a small town which today is mostly a tourist town including the oldest bridge and Catholic Church in Australia. 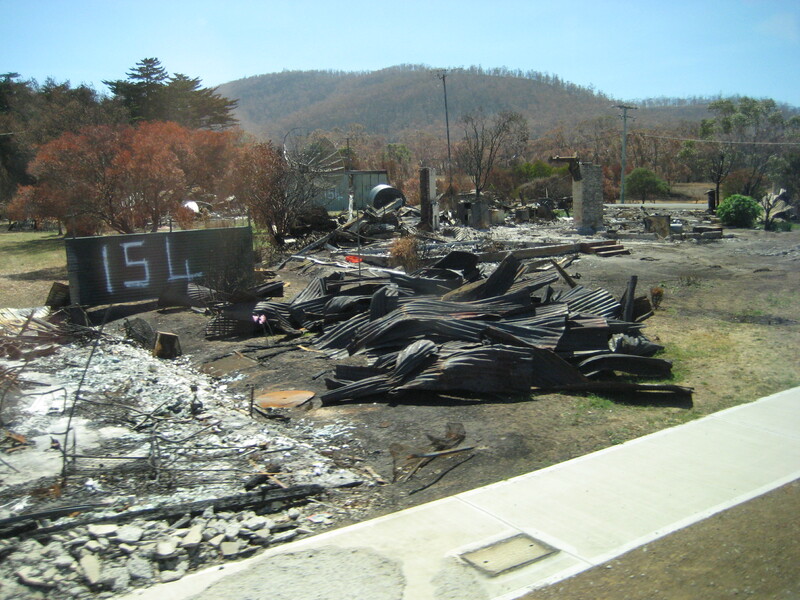 The area between Hobart and Port Arthur was devastated in recent weeks (January) by a horrendous fire, which blackened miles and miles of bush land and towns. Many houses, shops and vehicles still remain heaps of ash and metal. Fifty-two lives were lost in the fires along with a large number of homes, businesses and out buildings. They are just beginning to clear some of the debris after replacing most of the telephone poles and electrical wires. No sign of rebuilding yet, with the exception of trailers brought in to replace a grade school that was destroyed in the fire. 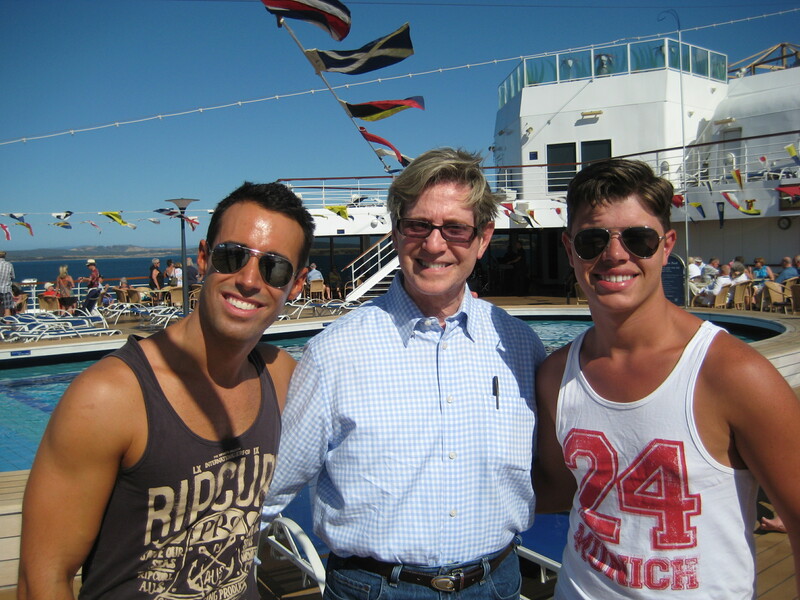 At the sail away today, we talked with friends, the new Canadian fellas and some of the Aussie Boys, who are a delight! The entertainer this night was a Soprano by the name of Colleen Williamson. She has a beautiful voice and performed a wide variety of music from opera to musicals.